The Canadian Mint has broken new ground once more – this time with the 1.25 oz Bison silver coin, the first of its kind ever to be made. In keeping with recent silver coins, the new addition to the Royal Canada Mint's wildlife collection contains a 99.99% purity, but has been given an additional 25% weight increase rather than the typical one troy ounce. Not only is the 2015 Silver Bison coin unique, it will be recorded in history as a pioneering coin that will most likely expand the bullion market with a wider range of full ounce and fractional products. Available in Brilliant Uncirculated condition, the 1¼ ounce silver Bison are available as individual items or sealed tubes of 20 coins and represent an excellent investment. The 2015 Silver Bison coin is another stroke of innovative genius by the Royal Canadian Mint and promises to be a special and lucrative long term investment. Being the first of its kind, the Silver Bison is not only unique, but carries a numismatic value that will be appealing to coin collectors in years to come. Struck with a .9999 purity, the silver coins are made to the highest standards and are meticulously manufactured using the latest techniques. 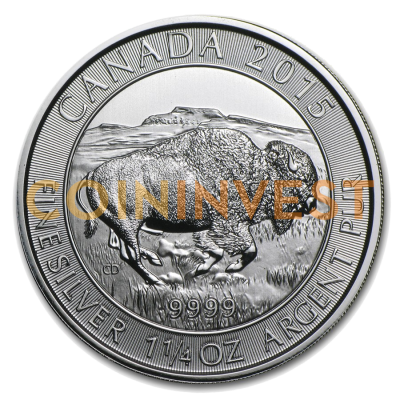 Furthermore, the additional quarter ounce weight make the Bison silver coins more valuable than the typical one ounce coins on the market and with current spot prices are much more valuable than the face value of $8 Canadian dollars (CAD). The Royal Canadian Mint has an excellent global reputation for producing bullion coins to the highest standards and the Bison is one of the highest quality silver bullion coins ever produced. As an example of this improved quality, 800 Bison coins were submitted to NGC for grading and scored an astounding and perfect MS70. Even silver Maple Leaf that typically grade MS67-MS68 cannot match these new standards. As a result, the coins will prove resistant to "milk spotting" silver coins are susceptible to over time. The reverse of the coin depict a lone North American Bison careering across an open plain with a tall ridge in the distance. Beneath the hooves are the numbers "9999" depicting the purity of silver content. The country and year of issue are engraved across the top rim whilst the lower edge reads: "Fine Silver 1 1/4 OZ Argent Pur" confirming the weight. On the obverse side is the familiar profile of Queen Elizabeth II which was produced by Canadian artist Susana Blunt and has featured on all Canadian coins since 2003. The face value of "8 Dollars" appears on the bottom. Launched in November 2014, the Silver Bison follows on from the success of the Canadian Wildlife series that was produced between 2011 and 2013. The Royal Canadian Mint (RCM) has a long-standing reputation for innovation and with the 2015 Silver Bison has pushed the boundaries of bullion coin production once again. Although originally established in 1911, the RCM did not come into public consciousness on a global scale until 1979 when they produced the Maple Leaf coin. What was special about the Maple Leaf Gold coin is that it increased the gold purity from 91.67 per cent to 95% and set a new standard in coin production. Three years later the RCM raised the bar again by producing gold coins with a .9999 purity. The new Silver Bison coins featuring anti-counterfeit technology that make the coins practically impossible to forge. Furthermore, they have thick dimensions and .9999 silver purity that cannot be matched by using other metals. The detail in the design is also very difficult to replicate without being detected by coin experts and experienced dealers. The 2015 Silver Bison coin is available from the CoinInvest online store for exceptionally competitive rates together with a small premium. To order the 1 ¼ ounce coins, all you need to do is tell how many you intend to purchase by and add to your basket using the fields to the right of the featured image at the top of the page. If you have any 2015 Canadian Silver Bison coins for sale we would love to hear from you. As a leading dealer in precious metal products we are always keen to update our stock and offer highly competitive prices for coins as rare and magical as the Canadian Silver Bison. All you have to do is get in touch with a member of our staff and we will be happy to prefer a fixed fee offer.